Learn some interesting information about Pakistan while enjoying a range of fun facts and trivia that's perfect for kids! Read about Pakistan's major cities, population, languages, history, currency, popular sports and much more. Pakistan is officially called the Islamic Republic of Pakistan. The name Pakistan, Pak (pure) and stan (land) means ‘land of the pure’ in the Persian and Urdu languages. Pakistan's land covers some 796,095 km² (307,374 mi²) about the combined land area of France and the United Kingdom. Pakistan shares a land border with Afghanistan, China, India and Iran. 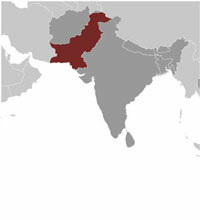 The population of Pakistan is 193 million people (193,238,868) as of July 2013. This makes Pakistan the 6th most populous country in the world. Islamabad is the capital of Pakistan, however as of 2013 it was only the 9th largest city in the country with just over 1 million people. The largest city in Pakistan is Karachi which is home to over 13 million people. It is the financial hub of the country and is a major seaport. The Indus area which covers the majority of Pakistan was home to some of the oldest known civilizations. The Neolithic Mehrgarh people and later the Indus Valley Civilisation lived in the area as long as 9000 years ago. Pakistan became independent in from the British Indian Empire in 1947. Pakistan was originally made up of East and West areas split either side of India. East Pakistan rebelled with a Civil war in 1971, and, with the help of India the area gained independence from the west and become the country of Bangladesh. The massive Karakoram, Hindu Kush and Pamir mountain ranges to the North of Pakistan contain 5 of the 14 mountain peaks in the world over 8000 m (26,250 ft) high. Including the world’s second highest mountain, K2 at 8611 m (28,251 ft) and Nanga Parbat at 8126 m (26,660 ft). The national language of Pakistan is Urdu, although the official language is English. Other languages spoken include Saraiki,Punjabi, Pushto, Sindhi and Balochi. The official currency of Pakistan is the Pakistani rupee. Pakistan's national sport is field hockey. The country has had a lot of success in the sport having won the Olympic gold medal 3 times in 1960, 1968, and 1984, and the Hockey World Cup 4 times in 1971, 1978, 1982, and 1994. Cricket is the most popular sport in Pakistan. The national team won the Cricket World Cup in 1992 and were World Twenty20 champions in 2009. The national drink of Pakistan is Sugarcane juice, called "roh" the juice is usually only sold by roadside vendors throughout the country. For more information, check out maps of Pakistan or take a closer look at the Pakistan flag.